SmartFocus understand every customer is on a unique journey. The customers’ motivations to try, buy or stay loyal change depending on the individual making the choice. Trusted by over 2000 clients, the SmartFocus Message Cloud sends out 55 billion personalized interactions and 7 million email campaigns annually. Although the customer has control, SmartFocus believe all their clients have the power to influence with their easy to use email solutions. SaleCycle’s integration with SmartFocus has made it easy for our clients to house all emails in one place. With results all under one roof, statistics on deliverability, open rates, click-through rates are all easily accessible. The direct integration allows us to dispatch awesome emails in real-time that seamlessly fit into the client’s digital campaigns. Together we can deliver clients robust campaigns where emails are dispatched on a one to one basis directly from the client’s domain. 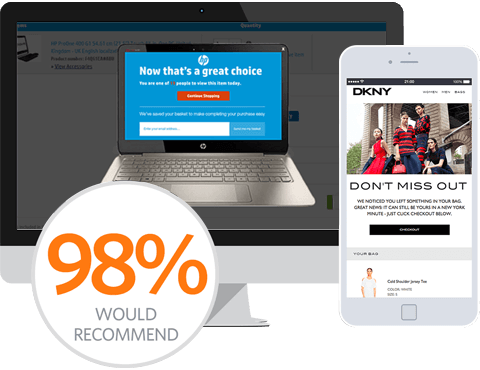 This level of integration ensures campaigns are trustworthy and seamlessly delivered within each customer journey a visitor takes. Deliver personalized emails that engage visitors with the right messages at the right time. Manage all email touch points from one platform. Build bespoke emails, personalized by the data learnt from the user's website visit.